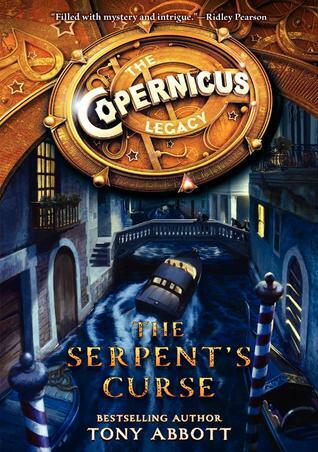 Presenting The Copernicus Legacy #2 The Serpent's Curse by Tony Abbott. Wade, Lily, Darrell, and Becca may have found the Copernicus Legacy’s first relic—a beautiful blue stone named after the constellation Vela—but they have lost much more than they have gained. Darrell’s mother, Sara, has been kidnapped by Galina Krause, the conniving leader of the Teutonic Order, who hopes that the renowned academic will lead her and her minions to the next relic. That means the stakes couldn’t be higher for the Kaplan kids, who trek across the cold wilderness of Siberia, along the winding canals of Venice, and through the streets of Moscow’s Red Square in search of their beloved family member and the sought-after relic called the Serpens. In the process, they meet another network of Guardians and discover that Galina’s plan for Sara involves a scientific experiment that could jeopardize her life. Filled with another globe-trotting quest and more riddles, puzzles, and secret histories, The Serpent’s Curse is a heart-stopping and suspenseful read for fans of Rick Riordan and Peter Lerangis. The second book in a six-book, six-novella journey, The Serpent’s Curse will leave readers hungry for the next adventure and excited to enter a sweepstakes to participate in a real-life scavenger hunt hosted by Tony Abbott that lets fans become part of the story. It is the next leg of the journey. Dr. Roald Kaplan, Wade, Lily & Becca may have found Vela but there are still more needed to be searched. Centuries prior Copernicus had disassembled this time machine and hidden its key parts to be guarded under lock and key (metaphorically) by these brave historical & mystical figures to be kept away from the fiendish clutches of the Teutonic Order. This may be a new age and a modern era but the order with the ruthless Galina Krause has come knocking and the Guardians of the relics must protect their dues even if their lives depend on it. Tony Abbott has presented a solid sequel. Following much of the pattern set in the first book, the high stake chase, the ingenious clues, the factoids, the relation to history and their jaw dropping heroics. The Serpent's Curse felt an experience much more heart-pounding. Our adevnturors have finally come to terms with their sacred mission. Their enemies are many but their friends are less and every second matters. Trust is a precious commodity not easily bestowed and once broken can never be regained. They realize that now such lessons have hardened them even more. Sara Kaplan is still missing, in the hands of the order but our Guardians have no choice but to keep going on. Success in their quest may be the only chance they could actually get her back. This time it is the serpens. A two piece relic that is needed to be rediscovered. With a history blacker than thou and an elusive background, our heroes must pool every resource at their disposal, if they are to not only find the relic but Sara too. Pooling all of their resources possible, the Guardians spread out throughout the continent to piece together their mission and if not but try and be a few steps ahead the order. Truly a hit by Mr. Abbott, this is an adventure that has something for all ages and we are more excited to see what adventures they have next. "Full of the intrigue and the mystery. An epic globe trotting sequel and a heart-rendering-ly gripping saga"